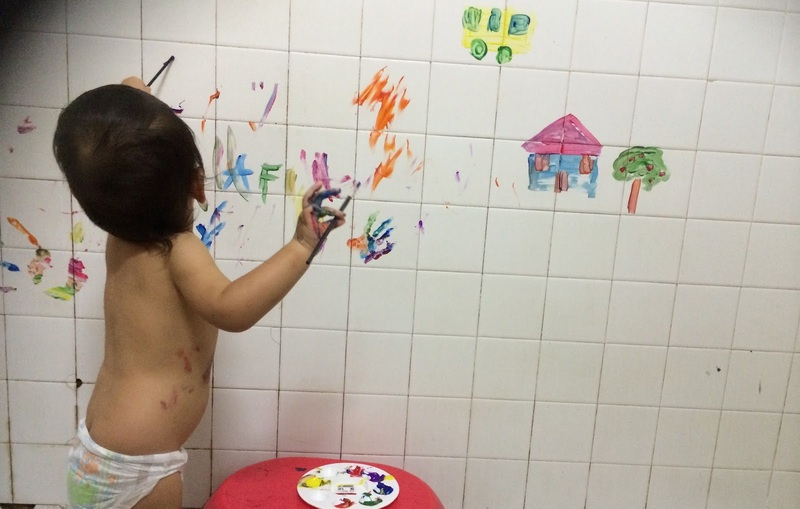 Toddler Activity: Bathroom Painting | Teefa Says..
Ok so Afif loves the iPad. i came to realize that after two mornings of him getting up and out of bed and point the iPad at me. Now before you bash me, don't worry. It's not an addiction yet. Setakat ni tak pernah la lagi dia mengamuk tantrum kalo tak dapat. Phew phew.. But yaa.. Of course we have to plan stuff for him to vary his activities. Mainan banyak tapi kejap-kejap main dia bosan. Dia suka main air, aku layan la jugak kat toilet tapi susah sebab takot basah hearing aid dia. Main hide and seek pon layan. Dia layan gak crayon, pencil color and magic color tapi lelama dia ada idea conteng dinding plak (-____-) so i minimize his contact with those. i got him this Crayola Washable Kids' Paint a few weeks ago. The first time we painted was one rainy day after he got up from his afternoon nap. Kononnya fun activity. Tapi time tu dia cranky, dia conteng sekali dua je pastu marah aku cat tapak tangan dia pastu we wrap up. So much for being artsy. The supplies for painting activities. Then yesterday i had this bright idea of combining his favorite place, the toilet, and some art stuff. 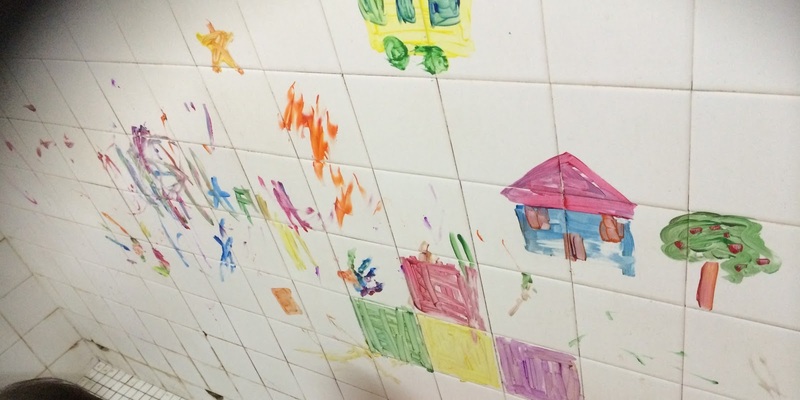 Maka terjadi lah bathroom painting! Bangon pagi dan brekpes, i stripped him down. Ingatkan nak mandi la tuh. He got excited pon seeing the paint i laid on the stool in the bathroom. Then i started painting the house and tree, he followed suit. But of course, no house, tree or even stick figures from him yet. Conteng-conteng ikot suka je. He was so happy experimenting siap cover toilet bowl pon dia conteng. i think this activity is good to train our baby's motor skill and also to teach them colors. i even mix a few colors together to create a new color for example blue+yellow=green! The best part is this Crayola Paint is totally washable. After our painting session, simbah air kat dinding tiles tu and gosok sikit-sikit pakai tangan je terus hilang color tu. No mess for lazy moms like me. p/s: malam tu dia amek pencil color dan conteng dinding rumah while i was busy in the kitchen. Laki aku gelak je "siapa suruh ajar conteng toilet?" katanya. Haihhh..